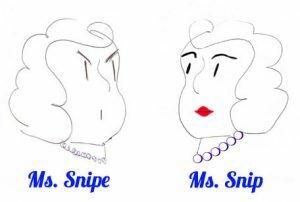 Ms. Snip: I asked my boss, someone who really knows my ambitions, strengths and weaknesses, what I could do to improve my opportunities and hopes for advancement. He said, “I really can’t answer hypothetical questions.” I reminded him these were not hypothetical, the question was based on my past performance history. He replied again, “It would be unethical of me to speculate based on past performance.” What can I do? Ms. Snipe: Are you sure that was your boss? It sounds like answers given too often in a congressional hearing. In fact, those aren’t answers they are evasions. Not wanting to tell the truth, sometimes lame excuses are offered. BC (Big Crybaby) has put forth a person (MO, major obfuscator) for a powerful lifetime appointment. Apparently, BC feels, based on previous statements by this person, that MO will serve him well if things get sticky. Seems to me this tactic is becoming the norm. No one seems to want to be honest about their beliefs or personal history. The dangling carrot offered becomes the most important focus. 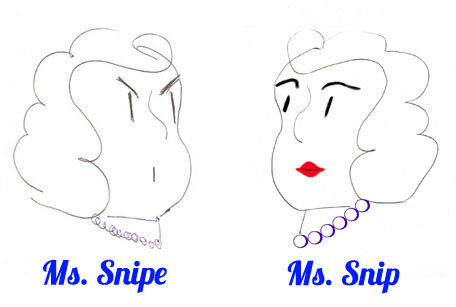 Ms. Snip: Aren’t there people who see through these veils of obfuscation? Aren’t they supposed to serve all their constituents? Can’t they set party aside for honesty? Ms. Snipe: Of course they could but, like your boss by giving a non-answer, they avoid controversy. They see their own dangling carrot and don’t want to take a risk. For them, the carrot of reelection is the only factor to consider. Ms. Snip: Wow, feels like basic honesty has taken a holiday. Ms. Snipe: I agree, more and more words are used to speak around topics rather than address reality. I’ve heard some talking heads (THs) trying to influence voting by assigning idiotic reasons to withhold support from X, Y or Z because TH says that person wants to: 1. Tear down the Washington Monument. 2. Open the borders to any and all who come through. 3. Raise taxes on the middle class. etc. etc. etc. Speaker A: (Not identified because, while the words were spoken by Speaker A I can’t believe they weren’t written by someone else) “We must maintain efforts to put our nation on a fiscally sustainable course and federal agency budgets cannot sustain such increases. · A wall may add more to the accumulating debt. · Economists see a 1.5 Trillion dollar increase in the debt based on new policies. · Costs of housing over 3,000 immigrant children grows daily. That example makes me wonder why current verifiable facts are ignored and followers are not given the whole truth. Speaker B: (Looking at the dangling carrot of reelection) “Does the Constitution say anything about abortion limits? · Probably no mention of abortion, nor does it mention specifically assault rifles, driver’s licenses, plastic guns, PACS, Citizen’s United, unlimited campaign funds, border walls, internet hacking, twitter, etc. etc. etc. This example makes me wonder why some attribute such narrow interpretations based on words from over 200 years ago. To me, some decisions seem unsustainable without consideration based on changes that have occurred in the world. If there were never need for change based on changing history, what would be the need for amendments? If the constitution were absolutely clear about all aspects of current situations, wouldn’t opinions be expected to be unanimous. But, it appears that interpretations are most often based on personal views and party expectations. Maybe it should be named the PPC (Party in Power Court). Anyway, Ms. Snip, maybe you should just work wisely. And, base everything you hear from politicians with a modicum of doubt. That might go for your boss as well.